At South Street Diner, A and I can't decide what to order. I came with the intention of ordering blueberry pancakes and coffee. A is thinking about eggs. But there are sweet potato fries. And there's a grilled cheese sandwich. We go back and forth and our waitress, who has fantastic dyed red hair, gives us all the time we need ("I'm here until 6!"). I like the place already. I can see why it has loyal fans and why it'll be the subject of an upcoming documentary. A asks if I want to split a frappe. I do. Absolutely. Then A looks straight at me: "Wait, what flavor?" The choices are vanilla, strawberry, and chocolate. I vote for chocolate and A is relieved. We start dead-panning. This is what A and I do. A says any other choice would have called our friendship into question and I agree ("We would have had to call off brunch."). We place our order: a grilled cheese sandwich with onion rings for A, a grilled chicken salad with balsamic vinaigrette plus a side of sweet potato fries for me. And the frappe obviously. We don't bother ordering it extra thick, because our waitress promises that her regular frappes are plenty thick. And she's right. It's a great frappe and it's hard to find good frappes in Boston. 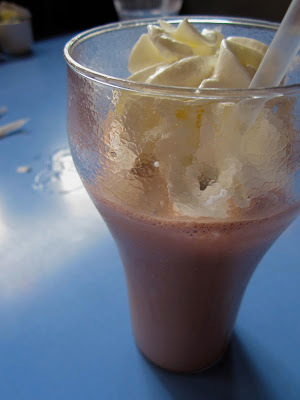 And I'm really into frappes (even though, where I'm from, they're called milkshakes). My salad is huge and much better than I expected. 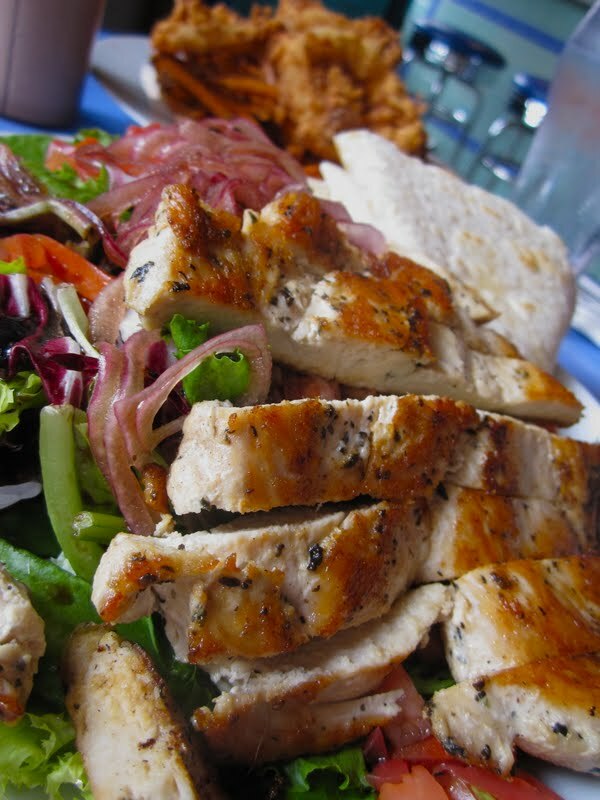 I tear off pieces of pita bread and roll up the mixed greens and chicken. We pile all of our fries onto one plate and graze. 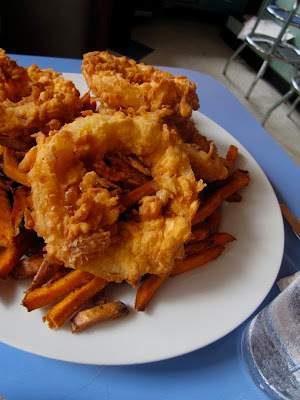 A isn't wild about the onion rings, but I like my sweet potato fries (though I don't know why they're listed under "Healthy Choices" on the menu). The diner is a little retro and a lot of fun. I beg A to get in the photo booth with me. We try to plan out our three shots, but we're not so good at synchronization. The photos turn out cute though. And when we're leaving, we see the mechanical horse out on the patio, mixed in among lounge chairs. I make a beeline for it. Obviously. Enjoyed reading this post! I'm actually one of the people making the documentary about the place, so it's become very near and dear to my heart. I love the grilled cheese and sweet potato fries, though the salads are surprisingly good when I feel like being healthy. 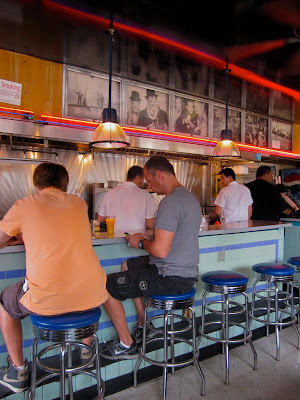 Happy to hear you enjoyed your South Street Diner experience and hope you check out the documentary when it comes out. In the meantime, I look forward to following your blog now that I've discovered it! Melissa, thanks for reaching out! I think the diner is a terrific choice of subject matter and I really, really look forward to seeing your documentary when it comes out... will you have showings locally? Can't wait to see it!